Driving away from outskirts of a camp in North Darfur, Sept. 2009. 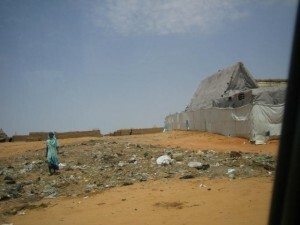 The camps are seen by the Government as an "eyesore"
Today the Sudan Tribune reported that in a radio interview, Sudan’s Humanitarian Aid Commissioner, Hasabu Abdel-Rahman, said Khartoum plans to close the IDP camps in Darfur by early 2010. I have some perspective on this from recent interviews in Sudan. But the desire is not just to win the elections (the conditions have already been established such that short of radical changes that I don’t expect to see, I think it’s safe to say they have that one in the bag already). The desire is to be seen as having won them legitimately, which in turn requires convincing anyone who would dare to say otherwise, that the elections will be “free and fair.” The consequences of this desire are seen in several areas, one of which is the aggressive agenda that Khartoum is now pushing on IDP returns. There is a very real sense in which those in Khartoum view the IDP camps themselves as the problem – as if the camps would disappear, then there would no longer be a “Darfur problem” and the world shift the spotlight. What the regime understands well is that “free and fair elections” and “2.5 million IDPs” are not concepts easily reconciled. Moreover, at this point in the conflict most of the camps are politically organized and so in addition to the international attention they attract, they also pose a threat to the NCP as concentrated clumps of political opposition. Conversely, maintaining international concern, and being able to organize politically are two key reasons that some of the rebel leaders (be careful not to assume these men represent the IDPs themselves) would want to see IDPs stay in the camps for as long as possible. So yes, I fear there is a battle looming over this in the next six months. The Sudanese High Level Commission on Humanitarian Affairs did recently endorse a UNHCR Returns framework with the conditions meeting international standards for returns. But Khartoum are masterful at signing pieces of paper that they render instantly worthless, so the question is whether they can forced to stick to it – especially given the domestic political pressures that stack up against it. 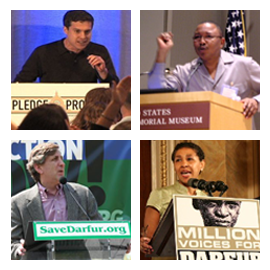 Organizations on the ground must do their best, but at the end of the day everyone working in Darfur knows they can be kicked out by the government at any time. So the real issue is whether political leaders regionally and internationally will grasp the importance of returns taking place in a manner consistent with the international standards of “voluntary, safe and dignified.” Not only must this be the way from a fundamental rights perspective, but it must also be the way if we are not to have this set of returns facilitate a new cycle of violence. Such an approach does not lend itself readily to any kind of pre-determined/ externally imposed deadline – let alone one as soon as the April 2010 elections.